Like several other Android Go Edition smartphones featured here on Phonerated, the NUU Mobile G1's cons include a couple of elementary hardware components, such as a MediaTek quad-core processor modestly running at 1.3GHz and a paltry (by 2018 Q4 standards) 1GB-only RAM . Having said that, these processing specs are the very reason why it runs on Android 8.1 Oreo Go Edition, since Android Go is a stripped-down version of the original Oreo platform that requires less processing power and consumes less mobile data allocation. The crown jewel among its pros and cons is its whopping 5000mAh raw battery capacity , which consequently makes it one of the cheapest big-battery smartphones around -- it was priced at $100 as of this technical review. 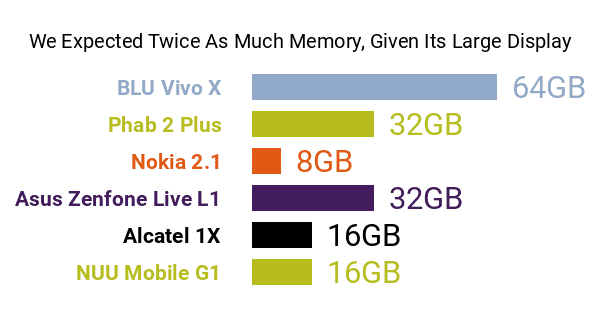 Feel free to compare it to other high-stamina smartphones here. Its aforementioned large battery promises up to 160 hours of continuous audio playback , which is equivalent to 9600 minutes, 15 hours of non-stop video playback (900 minutes) , and up to 50 hours of talk time (3000 minutes) . While on the topic of talk time, its VoLTE/ViLTE capability, which enables users to make audio/video calls over Wi-Fi networks sounds like a nice touch as well, especially coming from a low-budget Android. Looking into the rest of its pros and cons, the G1 touts a 5.7-inch display with an 18:9 aspect ratio , which was the go-to screen solution among many high-tier phablets and wide-screen smartphones when it entered the market. Sadly, its spacious display is marred by an unpromising HD+ 1440 x 720 definition only , whereas several similarly-sized 2018 models rock FHD+ (1080p) facades. As for imaging, this NUU G-series model does not go beyond budget-class norms, touting an 8-megapixel main camera with a standard Full HD (1920 x 1080) maximum video-recording resolution, while a mundane 5-megapixel selfie camera sits right above its screen. It comes with 16GB of internal memory, which can be expanded by no more than 64GB -- note that some of its rivals support up to 128GB microSD cards. With a 2.5D-curved glass shielding its display and an anti-slip coating covering its battery lid, the NUU G1 makes for a feasible choice for the power-cautious pragmatist.